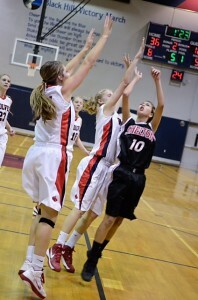 The Evergreen League may be housing the state’s best 2A girls basketball teams. W.F. West High School finished second in the state last year and have their top returning players clicking again in 2013. River Ridge, who finished fourth in the 2013 state tournament, have standout guard Jazzlynn Brewster and a host of other contributors back to lead the way. Joining the local contenders are the Black Hills High School Wolves, who have their own star and coach to lead a charge towards a state berth. Under head coach Tanya Greenfield, Black Hills stands atop the Evergreen League standings following a 7-1 start and a 3-0 record in league contests. Black Hills earned their biggest regular season win in years on Friday night, as they defeated River Ridge 62-61 on a buzzer beating shot by senior guard Taylor Sauls. It was the first victory over the Hawks by the BHHS senior players, and will go a long way towards playoff seeding come February. Heading into the contest, Greenfield knew how important of a game it was for her team. The win over River Ridge is not surprising, given that Black Hills has the luxury of having both an experienced roster and a coach who has playoff experience as a player and a coach. 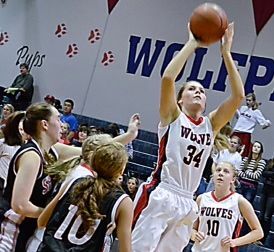 Black Hills High School girls basketball head coach Tanya Greenfield believes the defensive effort displayed by her team will be a deciding factor on whether the Wolves make the state tournament. 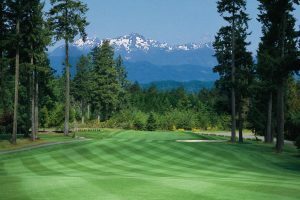 BHHS has the luxury of having both an experienced roster and a coach who has playoff experience as a player and a coach. An assistant coach for two years at Black Hills prior to her current head coaching run, Greenfield was a prolific all-around player for Sehome High School before playing collegiately. Greenfield was named Whatcom County Athlete of the Year as a senior at Sehome and would go on to play at Wenatchee Community College and Saint Martin’s University. Sehome played in the State Championship game during her senior season. In 2010, Greenfield’s first season as an assistant coach at Black Hills, Sarah McGee was a freshmen starter for a Wolves team that finished 4 – 17. Three years later, McGee, a 5’11″ guard, is a returning First Team All-Evergreen League player and a future Division I athlete. The time on the floor she saw as an underclassman gave McGee the experience that has shaped her success, both as a player and a leader. Every year since McGee’s freshmen season, the Wolves have improved their record from the previous campaign. 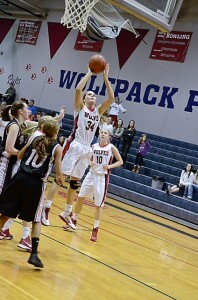 Standing at 5’11”, Black Hills High School senior Sarah McGee (#34) can use her height to score inside and rebound. Her skills as a passer and a ball-handler allow McGee to make plays for her teammates and will help her adapt to the college game next year. The team’s success, including a 15-8 record and a district playoff appearance in 2012-13, coupled with her statistical improvements put McGee on the radar of college recruiters. For her strong play, McGee garnered a scholarship offer from Southern Utah University in Cedar City, UT, a Division I program playing in the Big Sky Conference. McGee committed to the college, a decision that she made following her visit to the school and a discussion with her coach. On the court, McGee is far from the only contributor for Black Hills. Twins Sydney and Taylor Sauls join McGee as senior leaders and playmakers for the Wolves and only Hope Mortensen, who now plays volleyball for Saint Martin’s University, is gone from last season’s team. This experience as a team is a big reason McGee and Greenfield believe the Wolves can qualify for the state tournament in March. 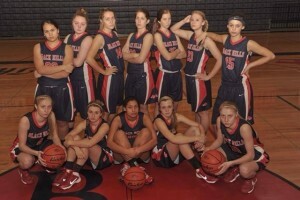 The Black Hills girls basketball team is looking for a trip to the state tournament. “We didn’t know how to win and we’ve changed that since freshmen year,” says McGee. As a senior captain, it’s a necessity for McGee to set an example for the rest of her teammates. Her dedication off the court has been nearly as important as her impact as a teammate on it. Playing under Greenfield has helped in McGee’s development as a student athlete. Will Black Hills combination of talent, leadership and coaching lead to a state tournament appearance? McGee and Greenfield believe the blue-print is laid out in front of the Wolves.